Dramatic coastal landscapes and fairytale Norwegian fjords will greet you when embarking on one of our Norwegian fjord cruises. Our range of voyage options includes something for those who like to explore on their own, or those who like things more organised. Voyage options can take you all the way along the long Norwegian coast, or just into some of the picturesque southern fjords. Choosing a shorter cruise in the southern fjords takes you closer to ‘real life’ and eliminates the need for tender transfers to shore. With so many amazing options, choosing where to go in Norway can be a challenge, so we hope our summary helps you find something that suits you. The most spectacular and most frequently visited fjords in the southwest of Norway are the Sognefjord, the Hardangerfjord, the Lysefjord and the Geirangerfjord. Then we have a number of smaller fjord arms coming off the main fjords. In the Sognefjord (Norway’s deepest) you will find the popular fjord-arms of the Nærøyfjord and the Aurlandsfjord, which are visited during the Norway in a Nutshell excursion. Off the Sognefjord we also find the Fjærlandsfjord stretching north from Balestrand, and which ends just underneath the majestic Jostedal Glacier, Norway’s largest. Join our Sognefjord in a Nutshell® to explore Balestrand and the Fjærlandsfjord. The Hardangerfjord is Norway’s third largest fjord and is home to a vibrant farming and orchard community. It is more commonly visited on independent self-drive tours, as a visit to smaller villages and farms is a highlight. For the active traveller, hiking opportunities abound, and the strenuous day hike up to Trolltunga is spectacular. The massive Folgefonna Glacier and Norway’s most spectacular waterfall, Vøringsfossen are also found in the Hardangerfjord. Trekkers can also access the Hardagervidda mountain plateau from the inner reaches of the Hardangerfjord. Hardangervidda provides brilliant hut-to-hut trekking options. 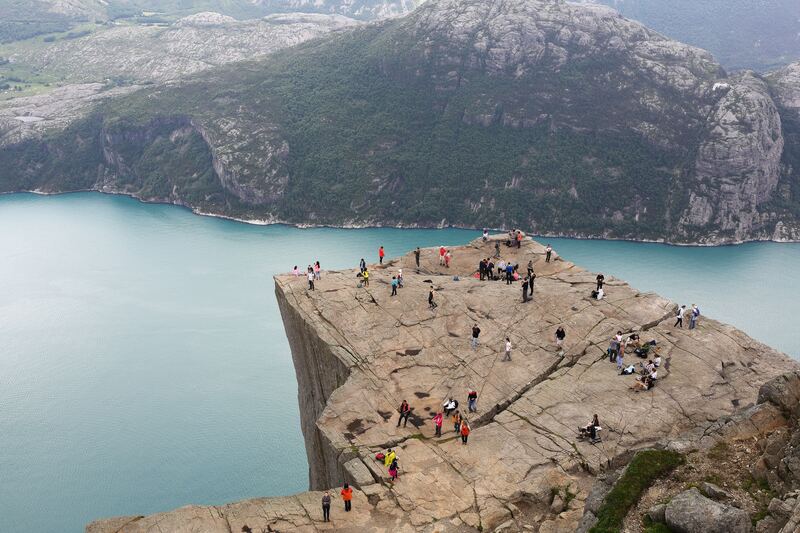 Pulpit Rock (Preikestolen) rises 600 metres up from the inner reaches of the Lysefjord. Joining a day tour from Stavanger, you can either walk to the top or marvel from the fjord below. Other significant attractions are the Kjærag Cliff further into the fjord, which is twice as high as Pulpit Rock. Lift your eyes to see Kjæragbolten, a boulder wedged into the crevice more than thousand metres high. Our Pulpit Rock and the Southern Fjords tour visits this region, taking you off the tourist track to experience small Norwegian villages and spectacular sceneries. The Geirangerfjord is most often visited during a summer voyage on board the Norwegian Coastal Voyage with Hurtigruten, or during one of our self-drive or coach tours. This small fjord village is host to thousands of tourists during the busy summer months, and is honestly best avoided in peak season. 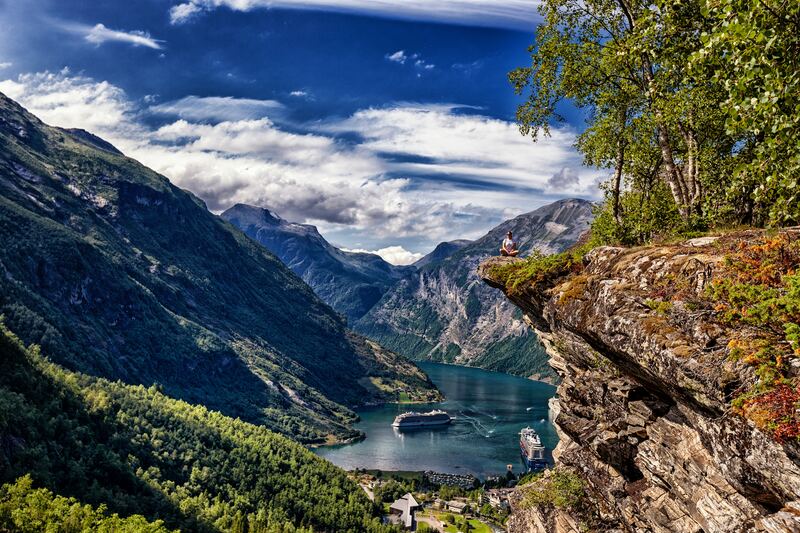 The Geirangerfjord cuts nearly 16 kilometres inland through Norway, and as such provides magnificent fjord vistas. Sail close underneath the famous Seven Sisters waterfall and the Suitor, located directly opposite each other on either side of the fjord. Those kayaking from Geiranger can cool down under their gentle spray. The Trollfjord in Lofoten offers some of the most beautiful photographic opportunities from the deck of a Hurtigruten ship, or from a fast RIB boat. This dramatic fjord lies above the Arctic Circle, in the midst of the Lofoten Archipelago. You can reach the Trollfjord on a Hurtigruten voyage, or by RIB from the fishing village of Svolvær. At 50 Degrees North we are all Scandinavians promoting our home region from the heart. Contact us to get expert advise on choosing the Norwegian Fjord Cruise that is right for you. With careful planning, you could visit them all, and even escape the crowds. Let us show you how to get close to Norway’s most beautiful fjord scenery with our tailor-made itineraries and Norwegian coastal voyages.